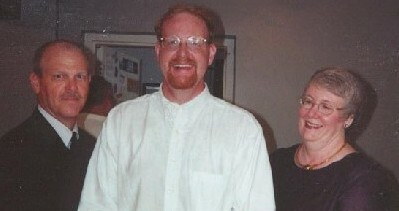 Chip and parents pose during college graduation open house Saturday 27 May 2000. Photo © Chip Bennett. All rights reserved. William Edward Bennett and Karen Ann Schouten were married Sept. 8th, 1973. My dad was born January 26th, 1948 and my mom was born February 22nd, 1951. I am their second child; my sister, Julie Ann, was born June 26th, 1975. My parents both worked for most of their careers in the Department of Defense. After Naval Air Warfare Center Indianapolis was closed in 1996, my parents were transferred to Patauxent River Naval Air Station. They worked there for about ten years before retiring and moving back to Indianapolis. My dad taught me to play tennis when I was in eighth grade, and was my personal coach all through high school. His teaching style was all his own; to develop my net game, he stood me at the net and hit balls at me as fast and as hard as he could. Oh, but it worked! Throughout my college career, I had some of the quickest, softest hands on the team. My dad is also an avid golfer. He learned to play from my grandfather. He stopped playing for many years, but picked it up again when my parents moved to southern Maryland. He has now, I believe, a 3 or 4 handicap. Consider also that my dad played amateur ice hockey when he was my age, and you can easily see where I got my athleticism. Interestingly, my mom was born in Michigan, where I lived for two years after college. Of further interest, I have ancestors on my mom's side of the family who helped till the first fields in what is now Terre Haute, IN, where I attended college.